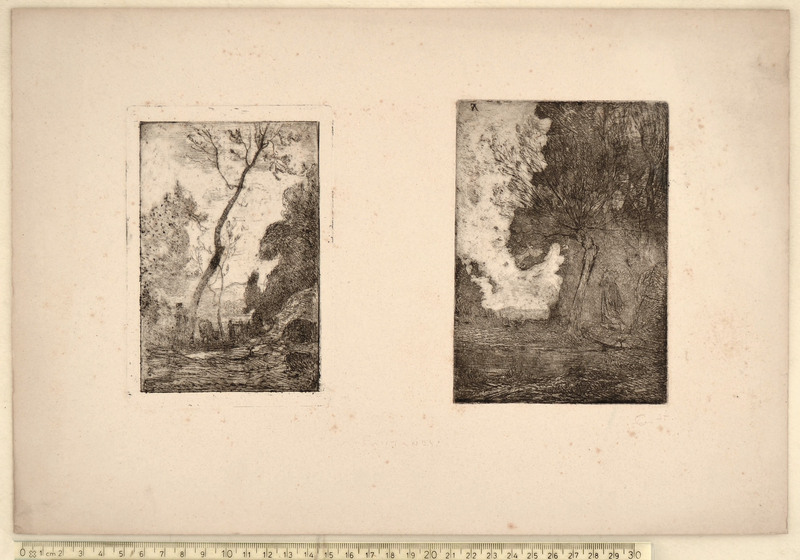 A pair of etchings printed on one sheet of ivory thick and soft wove paper. a) Dragone 58, second state of three, to the platemark 148 x 100 mm. b) Dragone 62, first state of two, to the platemark 148 x 104 mm. The sheet, measuring 258 x 380 mm, has been inscribed in red chalk at bottom center A. FONTANESI and at bottom right LC st. The inscription is surely by Luigi Conconi and demonstrates that the impressions were pulled by him. Inscriptions with the same type of red chalk, which tends to disappear, leaving a dry imprint on the paper, are found on Conconi's own etchings. To my knowledge this is the first evidence of a contact between the two artists as printmakers. Minimal foxing, otherwise in very good condition. Fontanesi studied at the Scuola di Belle Arti in Reggio Emilia. 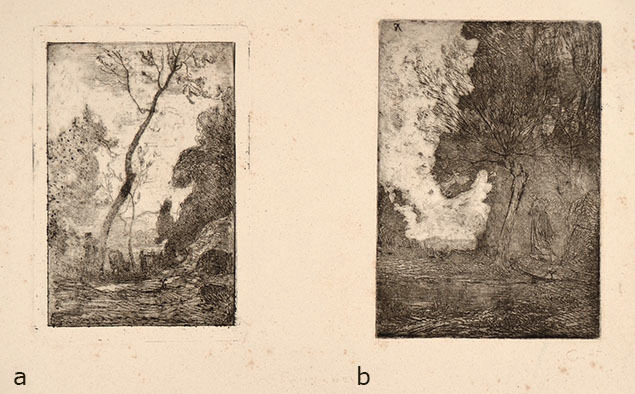 Between 1841 and 1846 he made the sets for the city theatre and began painting landscapes. In 1850 he moved to Geneva, working within the sphere of Alexandre Calame, Corot and Daubigny. Here he set up a studio and displayed his work at the main exhibitions. His main area of interest was landscape painting, which he expanded on after visiting the Universal Exhibition in Paris in 1855. This trip marked the beginning of a period characterized by important exhibitions and by prestigious appointments, such as his nomination as director and professor of illustration at the Academy of Lucca, but above all his chair as a landscape professor in Turin. In 1876, the Technical Fine Arts School, an art school of painting and sculpture, was founded in Tokyo. It was the first governmental art school founded in Japan. The Meiji government contracted three Italian artists as foreign advisors: Vincenzo Ragusa for sculpture, Antonio Fontanesi for drawing and Giovanni Cappelletti for the preparatory course. The trio greatly influenced the development of Japanese art through the next several decades. 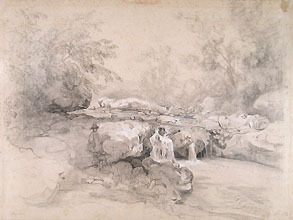 Fontanesi introduced the techniques of charcoal, crayon and oil paints to his Japanese students. He also taught western concepts of perspective, anatomy and sketching from life. His career in Japan was cut short by serious illness, which forced him to return to Italy in 1878.